This Green Chile Egg Casserole recipe is so simple, yet so delicious! 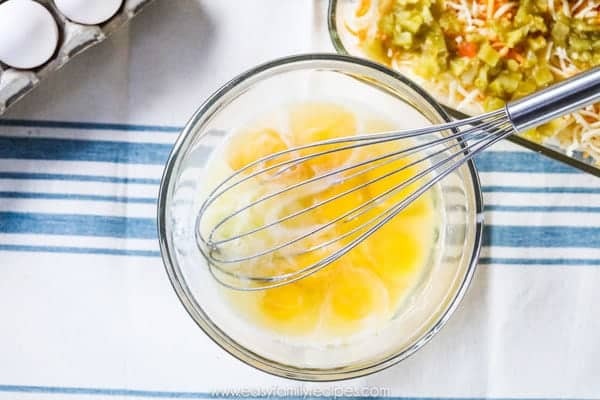 It is the perfect addition to a breakfast or brunch spread and has all the great savory Mexican flavors without being very spicy so it is perfect for adults, kids and every age in between. 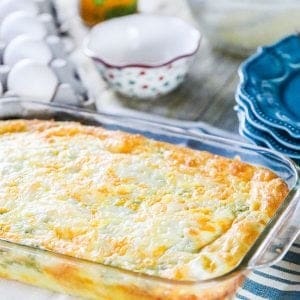 It is always a hit for a brunch or morning pot luck since it feeds a crowd! My mom has been making this breakfast casserole as long as I can remember and I have been devouring it as long as I can remember. 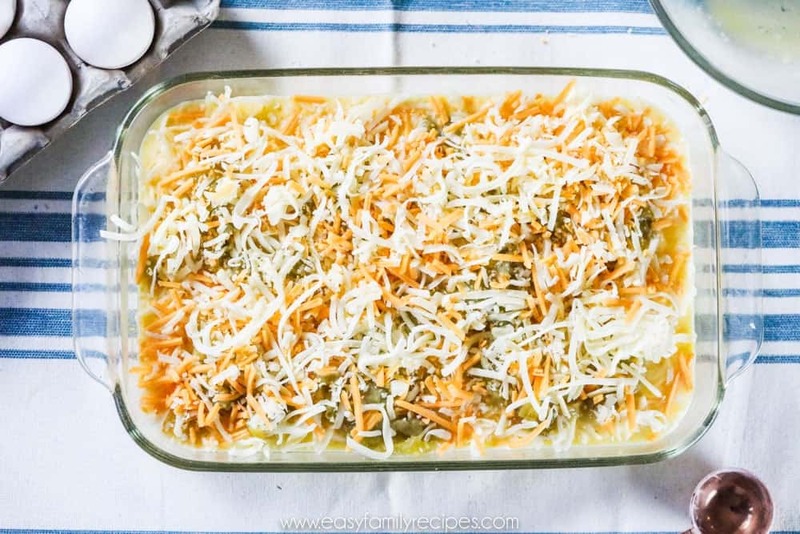 It is a nice change from the norm because it uses just green chiles and cheese to give it flavor so instead of the usual breakfast tastes it has more of the feel of a mexican breakfast casserole. I have made this for endless brunches and breakfast events and it always seems to be a hit! The green chiles have a nice tangy flavor without carrying much heat so it is pretty friendly for both children and adults. If you have never cooked with green chiles, you are in for a treat! I use green chiles in my cooking quite a bit since they have such a great complimentary flavor, like onions or garlic, for cooking. If you have never used them and don’t really know what they are, don’t fear! They are great and I am sure you will soon be mixing them into just about everything too! Green chiles aren’t just for breakfast casseroles though! If you love them as much as I do, then make sure to try out my Green Chile Chicken. It is such a great easy dinner recipe! Green chile peppers are a 5-8 inch, fleshy pepper that can range from mild to spicy. They grown across the southwestern region of the United States and throughout Mexico and are staples in the cuisine. New Mexico is especially known for their variety of the Hatch Green Chiles which is growing in popularity all over the United States. Many grocery stores will even have festivals where they roast them and feature them in other prepared foods. If you see one of these, most definitely go and try a few things! If you eat them raw, green chiles tend to be crisp, and have a stronger flavor with a bit of a bite like raw onion or garlic. When the peppers are cooked they mellow and become sweeter. The peppers are often roasted fresh, but can be bought canned both whole and diced in the Mexican food section which is how I mostly use them. 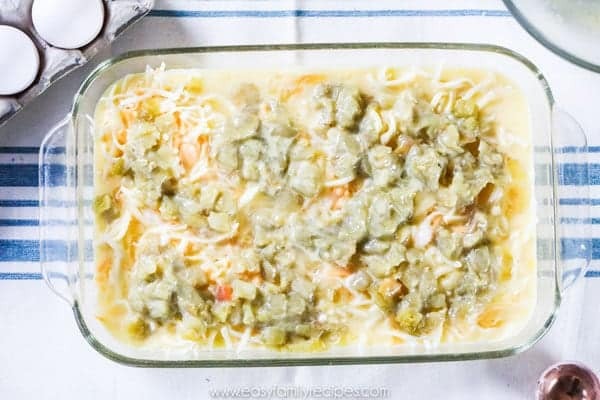 I have been making this green chile egg casserole for years and have accumulated a few tips and tricks along the way! Follow along below for step by step recipe below, or if you want the quick version, then skip to the recipe card at the bottom. I also like easy and hate a mess, so I have this recipe down to a science where you only need 1 mixing bowl, a cheese grater and the baking dish. Less dishes = Happy me! 8 oz sharp cheddar cheese, grated- You can use pre-grated here if you have it. I like sharp because it gives you the most flavor for the least amount of cheese, and so I try to pack in the bang for the buck with sharp cheddar. 7 oz canned mild chopped green chiles– You can find these in the mexican section at most grocery stores. I have lived all over the US and they are almost always there. The small cans are 4.5 oz, and the large ones are 7 oz. I usually use one large can but you can also throw in 2 small ones. It will end up to be a little more green chile over all if you use 2 small cans, but it still tastes great. 1/2 cup milk– I use low-fat, but use whatever you have on hand. Mix the cheeses and then sprinkle 1 cup of the cheese (about 2/3) in the bottom of a casserole dish. Next, dollop the green chiles evenly over the cheese. You don’t have to be super exact about this, just try to distribute it as evenly as possible so that each bite has an equal amount of cheese and chiles. Place the flour in the bottom of a bowl and use a whisk to slowly mix in a little of the milk to make a paste, then continue to pour the milk in while whisking until it is all smoothly combined. Then add the eggs into the milk, season with salt and pepper, and use the whisk to combine well. Pour the mixture into the casserole dish over the cheese and chiles. This step is important to get the flour mixed smoothly into the egg bake. If you mix the four in at the end it doesn’t mix in nearly as well. If you start by making a paste at the bottom of the bowl with a little milk, then it mixes in perfectly. Top the casserole with remaining cheese and then bake on the middle rack of the oven for 25-35 minutes or until eggs are set in the middle. You will know the casserole is ready because the eggs will not jiggle in the middle anymore. you can also stick a toothpick in but since the casserole is pretty cheesy, it sometimes is hard to tell with this method so I like to just give it a gentle jiggle to make sure the center is set. Remove from oven and let sit for 5 minutes then serve hot. When you first take the green chile egg casserole out of the oven it will be big and puffed up. Let it sit about 5 minutes before you cut in and it will cut and serve better. 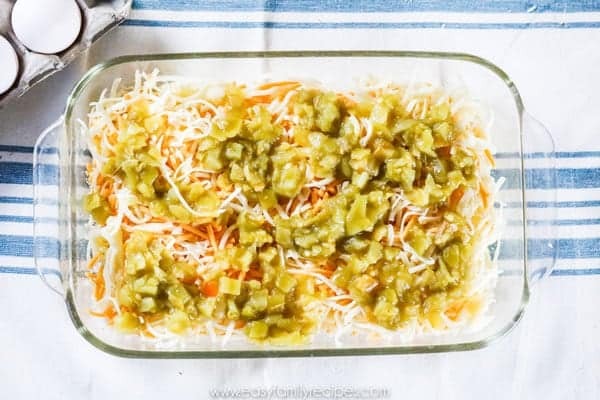 I hope you enjoy my green chile egg casserole recipe as much as our family does! If you get a chance to try it and enjoy it, I would love to hear about it in the comments. Or snap a pic to share on Instagram and tag me @easyfamilyrecipes. It makes my day to know people are enjoying my recipes. 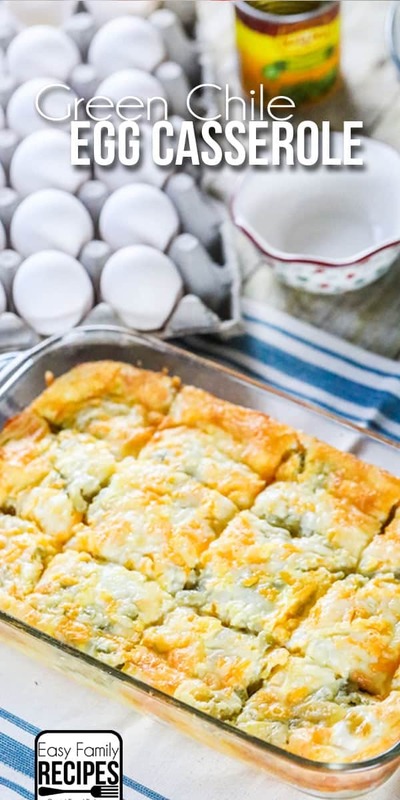 This green chile egg casserole is a favorite for brunch or morning pot lucks! It has a great mexican flavors without being spicy, so it is friendly for adults and children alike. Mix the cheeses and then sprinkle 1 cup of the cheese (about 2/3) in the bottom of a casserole dish. Then dollop the green chiles evenly over the cheese. 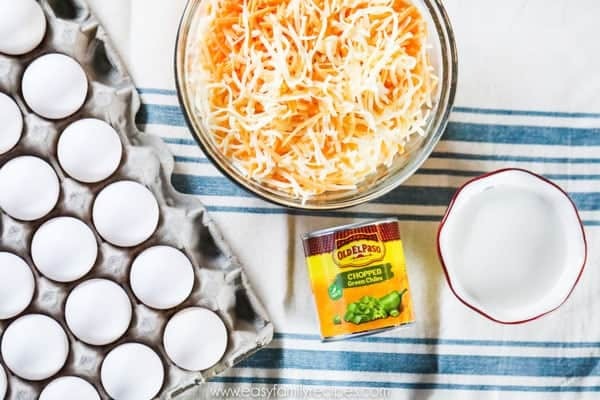 Top the casserole with remaining cheese and then bake on the middle rack of the oven for 25-35 minutes or until eggs are set in the middle. Remove from oven and let sit for 5 minutes then serve hot. Enjoy! Leftovers can be refrigerated and reheated. This can be prepared the night before and baked in the morning but cook time will increase. Do you think I could sub out almond flour and it work ok? If I can respond to Krista, I think that millet flour would be a great substitute for flour in this recipe if you are looking for a gluten free option. I think millet flour behaves most like flour especially when making things like roux. I know you’re not cooking this with butter like a traditional roux but it is acting like it in the form of thickening the casserole while it’s baking. Making this for breakfast! Did you use a 9×13 baking dish? Wondering what size pan too?? 8×12 or 9×13? I just made this exactly as written and I love it! It hits the spot! What size pan did you use! I used a 2 qt dish. I generally use a 2 qt corning ware dish. I only have one small can if green chili on hand. Do you think if I halve the recipe it will turn out okay? I’m going to try it this morning!